How and why are certain stories covered? What part does media bias play? What does it mean to write news with accuracy and objectivity? NewsFrames has been an opportunity to take seriously the challenges of diverse cultures, ethics, and truth in reporting — through the lens of data — all while having a lot of fun and joy in between. The Reframed Stories Project asks people to respond to dominant themes and issues that appear in news coverage about their communities. These stories are reflections by people who are frequently represented by others in the media. 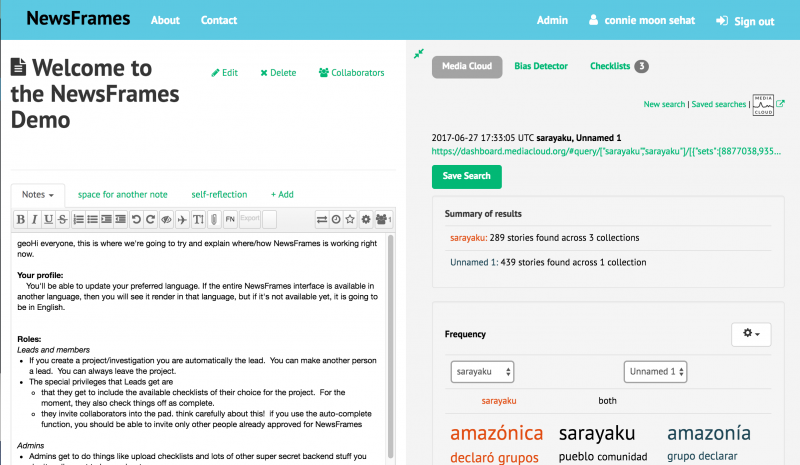 The NewsFrames platform brings together checklists and tools journalists can use when working on stories, to facilitate collaboration, as well as generate data for media analysis. Customizable checklists that enable teams to repeat processes and become more methodical. The NewsFrames platform can be accessed at www.newsframes.org. Code for Version 1.x of the NewsFrames Platform, along with its open source license, can be found on GitHub. Language localization of the NewsFrames user interface was accomplished via Transifex, and is currently in French and Spanish. While the NewsFrames project is on “pause” as of May 31, 2018, it is still possible to use the NewsFrames platform to conduct an investigation. Refer to the short Getting Started With NewsFrames guide, and contact Eddie Avila or Ivan Sigal for more information.